Your sound asleep in your tent in the backcountry and your awaken by the unmistakable sounds a bear outside your tent sniffing around. So what do you do in this situation, call out and hope it spooks or hold your peace and hope it moves along on own? Actually had this happen one morning last year just before the elk season opened. I just didn't know what was making the sound until I came out of the tent after breakfast with fresh snow and ice on the ground. The bear tracks were about seventy five yards from my tent. So bottom line, make noise, or just poop yourself and stay quiet? You first point your gun in the direction of the noise, then you yell. I would actually talk in a low voice telling him to get the hell out. Definitely wouldn't make a whole bunch of noise or beat on the tent. The low voice might not even get it to leave, but I've done it, several times. Sometimes it worked, sometimes not. Ear plugs are mandatory, so are partners that are afraid of bears so they'll be up all night and the first to let you know when something isn't right. In the case you brought up, my handgun would be in my hand and I'd stay quiet, certainly (like Ron) wouldn't be making any unnecessary commotion or yelling. No issues yet for me, but I am sure that'll change at some point. I'd have no idea if there was a bear 75 yards from my tent, my take on the question and the answer I gave was more for 10 yards or less from my tent. I'd guess many bears have been within 75 yards of my tent throughout the night, not really an issue IMO. 75 yards and I'd probably yell. 75 inches and I'm playing Jurassic Park... hopefully with a gun in hand. I had this happen during the day. It was raining and I was in my tipi. 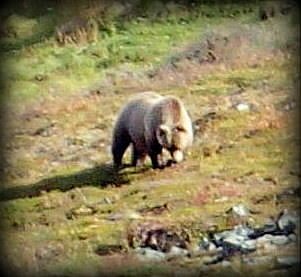 The bear in the picture came into my camp and circled one side. I stayed quiet but had the magnum in my hand and pointed at the noises outside. I decided if the tent bulged inward I was going to yell once and then put a round directly into the bulge. The bear didn't press the issue and left peacefully. At night I would likely do the same thing. If the bear got too nosey I'd probably make some serious noise, maybe even fire a round into the floor if I though necessary. Keep in mind a night-fight with a bear is a very bad thing. An available headlamp or tactical flashlight could be extremely valuable. For me, if it isn't touching my tent, I am as quiet as a church mouse! No need to ring the dinner bell for a hungry Griz or anything else that wants to do me harm. … and yes gun in hand! Kind of funny story, I once had a great horned owl land on my tent at 2am. Scared the shiznit out of me, and him when I punched him through my tent roof! He flew off hooting like a banshee! Funny now, not so much then. I thought I was going to die at the hands of the evil beast outside my tiny tent! I didn't even have a pistol with me then, I think I was 19 or 20 at the time. Ear plugs. I use them in WY and on Kodiak. What you can't hear won't get you. I'd say if a bear is close enough to be nosing right at your tent, he knows you're in there and that has not deterred him to that point. Kevin brings up a good point, I always keep my head lamp somewhere that I can grab it quickly if need be, not being able to see would make it hard to deal with anything. You guys are tougher than me! If I see the tent bulging inwards I'm not making a sound only to make him possibly jump back only to lose perspective on where he is. The next move might be predatory and violent. Sorry, call me a wimp, I'm shooting as soon as the tent bulges in from the outside. He's already inside my space when he's in camp. The fact he's now on the tent, surely has smelled me, it's full on personal defense. This scenario actually happened to me on my first trip to Alaska , out of King Salmon. My hunting partner was asleep and when I heard something, I couldn’t tell if it was coming from him or from outside. After a while I knew something was behind the tent and very close... We kept a .338 loaded between us. I sat up and took the safety off. Our front door was open but the screen was up. There was a full moon and it was very bright. I could see very well as if there was a street light above the tent. I turned my head to listen behind me and when I turned back there was a Brownie standing broadside at exactly 7 yards. He looked huge and was staring right into the tent. It’s hard to explain but I just didn’t feel immediately threatened . I think it was ....., I guess it was his non threatening posture. Like I said he was broadside with his head turned looking at me. He slowly turned and started walking directly away. I shook my hunting partner without taking my eyes off the bear and told him there was a bear in camp. He first saw the bear at about 40 or fifty yards. We got out of our bags went outside and made some noise , but by then that bear was well on his way. The day before this we had both our caribou flown out. There was no meat. But we kept our heads about 150 yards away at the lakes edge.... where we had spent that day caping. Glad we cleaned up good and kept a clean camp. That bear found our capes rolled and salted down by the shore. He chewed up my buddy’s cape and we never did find mine. And somehow we were okay with that. I knew a man that was attacked by a grizzly in Alaska , while he slept in his tent. My best friend moved to anchorage about 30 years ago. He made good friends with an older gentleman. The man , Helmut , was a German citizen who retired to Alaska so he could hunt and fish. Helmut had a friend that was a bush pilot and he often hunted out of Kotzebue. One year Helmut killed a Dall sheep and by the time he rolled into bed he was 100% physically spent. By his own admission he crawled into his bag smelling of sheep. Well , he awoke to a grizzly clamped on his shoulder.... and the next few minutes were a whirlwind. But , I asked him what did he think caused the bear to give up. And he told me he yelled as loud as he could in the bears ear. And we surmised the bear realized he didn’t have a sheep.... anyways he said he curled up and waited in fear for the bears return. He said , by far the waiting for daylight was a million times worse than the attack. Helmut moved back to Germany where his wife wanted to end her years. And I’m sure he’s passed. I’m also sure he wouldn’t mind me sharing this last word. He said when daylight came he cried like a baby..... releasing that built up emotion that the bear would come back in the dark and finish him off. Early that morning his bush pilot friend did a fly over and saw the camp torn apart ... landed and saved Helmut ‘s life. If you are going to shoot through the tent .... make damn sure it's not a "2 legged" bear. I read a story about a guy who killed his hunting partner .. His buddy thought it would be funny to scratch the outside of his tent and make a growling sound ... point and shoot - dead buddy. I always tell my partners that when I walk out in the dark, I'm carrying my handgun so don't jump out of the bushes and growl -- you could get hurt. I'd get my bear spray ready...or does that stuff not work in this scenario? I think the rule for inside of a tent is that bear spray gets downgraded from the Weapons category to a Condiment. Hard enough to deal with one in the dark, let alone when you’ve disabled yourself with the spray. I think I would speak calmly and firmly to make my presence known. Maybe just turn on a flashlight? Black Bear country, I think you could smack a bulge in the side of your tent with a canoe paddle or a stout chunk of wood and win. From the bear’s perspective, the tent is bigger than he is, so when the larger opponent gets in the first good, solid lick, it’s time to run like hell! Well I hunt solo so if someone is outside my tent and hasn't announced themselves I'll assume they have bad intentions. The one thing I've taken away from this thread so far is I should consider a handgun. Not to debate gun or spray. But I really never gave it a thought from inside my tent. I just told my wife she needed to buy me a handgun. Her response was why do I need to buy you a gun you got life insurance. I think my wife is evil sometimes. Inshart makes a good point. I'm not a prankster in fact that stuff can piss me off sometimes. We were packed into the Beartooths one time and I had a buddy who thought it would be funny to do that same thing, sneak out and rustle the tents. Not funny. I happened to sleep through it but the other guy up there was close to putting a bullet through his dome thinking it was yogi. I wouldn't have blamed him if he did. No time for that kind of behavior in my opinion. 16 years old and camping on a small island in Canada across the border from my parent's cabin on Rainy Lake. We had a .22 firearm with a mix of shorts, longs and long rifle cartridges. Something hit a guy rope and we unzipped the tent to see a black bear about 5' away. Zipped the tent up and sat quietly and nervous. "I'll tell you what. Let's put up $100 each. I'll have the money in my left hand and bear spray in my right hand. If you can get to me, you win and get the money. But there's no way you'll win." Me: "I'll take that bet for sure. Got your spray ready? Get in the tent and crawl into your sleeping bag. I'll turn out the lights and we'll go for it." I also use an electric fence. That being said, in the tent at night my 44 is tethered to my wrist, lights by my head with my knife and spray just outside the door. I like options but hope to never use them. I'd wager if a bear is within "camp", then he already knows you are there too and exactly where you lay. I don't know much at all about grizzlies, but blackies I have encounters with every year fly-fishing and backpacking. I'm gonna try and run a black bear off first thing. I want to push him out, knowing that if he decides to take me down it's because he has already committed to actually eating me (as opposed to mauling me). It's eerily demoralizing when you have a blackie keeping your "6", and the smell of trout is all over your hands and elsewhere inevitably. That's the scenario that scares me the most. Usually, when they come into to camp, they are just wanting to double check for "camping food" that should be available, because that's what the last visitors at the site left for them! I'd wake up and think "How the hell did a grizz walk 300 miles?" And after the encounter was over clean out my drawers, bag and tent.